Q. How can I submit a paper on behalf of a student? Enter in the relevant details and click on the Browse button to navigate where this paper is saved to and then click on the Upload button to commence upload. The option for staff to bulk upload papers is also available. Staff should still ensure that all students are aware Turnitin will be used in the assessment process. 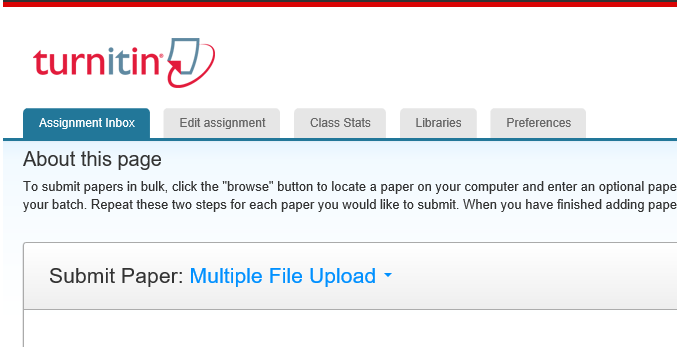 To submit multiple student papers in one upload, choose the Submit button at the top of the Assignment Inbox tab. Then choose Multiple File Upload to navigate to individually saved papers, or Zip File Upload if all papers are contained in an existing Zip file.